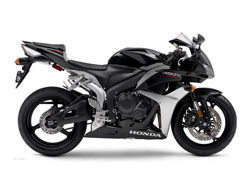 Description Up until two days ago, I was the proud owner of a shiny new 2007 black & silver Honda CBR600RR... I was crazy enough to extend my Army service, and got a bonus--I promptly spent it on a down payment for this bike. I JUST got it back from the shop after hooking it up with LED lights, a fender eliminator kit, a tinted windscreen, a set of black anodized aluminum frame sliders and Scorpion carbon fiber slip-on exhaust pipe.